Without accurate carbon monoxide detection, a malfunctioning furnace, gas oven, or water heater can turn indoor air deadly toxic really quick. 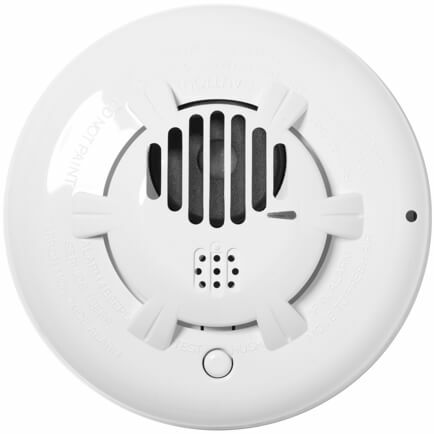 Vivint CO Detectors use electrochemical sensors to provide life-saving protection that’s monitored around the clock by our security team. If a carbon monoxide leak is ever detected, having a connected Vivint system helps clear the threat as quickly and safely as possible. Our CO detectors automatically unlock doors, disarm window sensors, and crank up your furnace fan to ventilate your home and start clearing dangerous CO levels. No matter where you are, the Vivint Smart Home app shows you mobile alerts whenever your carbon monoxide detector goes off. We’ll send emergency services to check on your home, and make sure your family’s safe. The professional security monitoring that comes with Vivint Smart Home service gives you around-the-clock support emergency support. If you ever need to evacuate your home in a carbon monoxide emergency, Smart Home Monitoring Specialists will contact emergency responders for you while you take care of your family and pets. With its five-year electrochemical sensor and backup battery, your Vivint CO Detector provides worry-free protection for years to come. And instead of annoying, middle-of-the-night beeps when the battery runs down, you’ll get alert notifications on your control panel and Vivint Smart Home app. Don’t worry about tackling installation on your own. Instead let Smart Home Pros install your system, sync your devices, and link your account in the Vivint Smart Home app. Since carbon monoxide detectors are essential to home security, they come with every single Vivint Smart Home system.